We take great pride in being "Small Business Focused". Small businesses are the backbone of our great country, and we're here to help you Build Awareness, Increase your Revenue, Boost your Employee Morale, and reward your loyal Customers & Clients. We'd love to be your trusted Promotional Branding & Marketing partner. Southeastern Wisconsin's Premier Promotional Product Source! 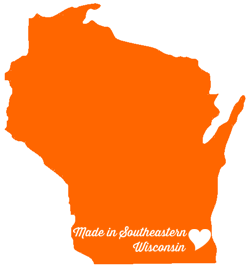 We're proud to provide Promotional Products to clients in Milwaukee Wisconsin, Kenosha Wisconsin, Waukesha Wisconsin, and the rest of the United States from the beautiful shores of Lake Michigan in Racine, Wisconsin. We LOVE serving our clients. From small businesses and organizations all the way to Fortune 500 companies. You'll receive quality, personal customer service with a hometown feel. Let us know how we can help you reach your goals!